Cardiopulmonary exercise testing, often abbreviated as CPX, CPEX or CPET, is now the ‘gold standard’ objective tool for the evaluation of cardiopulmonary function and fitness. It is an entirely non-invasive and objective method of assessing integrative exercise responsesinvolving the pulmonary, cardiovascular and skeletal musclesystems, which are not adequately reflected through the measurementof individual organ system function. Hence, CPX evaluates the way in which your heart, lungs and circulation simultaneously respond to exercise. A pacemaker is a small electronic device that helps the heart to beat a t a proper rate. It keeps track of your normal heartbeat, and can sense when it becomes too slow. When that happens, the pacemaker generates a small electrical impulse, very similar to the heart’s natural impulse. This keeps your heart beating at a normal pace. Your pacemaker has two main parts: the generator and the lead(s). The generator is a small, flat, lightweight metal case that contains a tiny computer and battery. This is the part that generates the electrical impulses. The leads are wires covered by soft, flexible plastic. Working together to regulate your heart, they monitor how well the heart is beating and will send electrical impulses from the generator to the heart when it senses it is necessary. Ordinarily, your heart beats at a regular, steady pace called a normal sinus rhythm. It is regulated electrically by the sinus node. However, if certain cells in the lower chamber of your heart (the ventricles) begin to generate their own electrical impulses, these can override the heart’s normal electrical control mechanism. These impulses do not follow the heart’s normal conduction pathway, and may prevent the heart from pumping enough blood and oxygen through the body. One situation, called ventricular tachycardia (VT), may cause you to feel fluttering in the chest or throat or a sensation of dizziness and lightheadedness. Because less blood is pumped with each beat, your body and brain receive less oxygen-carrying blood, which may result in dizziness, blackouts or fainting, and even unconsciousness. Sometimes VT can be prevented or treated with medications. In other cases, an electrical device is needed to deliver an impulse to the heart to stop the arrhythmia. When the ventricular arrhythmia becomes even more rapid and unstable, it causes a condition called ventricular fibrillation (VF)-the heart is quivering, and no longer pumps any blood. This leads to cardiac arrest. The only way to correct ventricular fibrillation is to quickly deliver a strong electrical shock to the heart to stop the abnormal rhythm and prompt the heart’s normal electrical conduction system to take over again. This process is called defibrillation. In a hospital or ambulance, when emergencies cause life-threatening arrhythmias, defibrillation is done with an external device called a defibrillator. Paddles are placed against the chest, and a strong electrical impulse is delivered through the heart. However, if your arrhythmia (either ventricular tachycardia or fibrillation) occurs in routine situations, an automatic implantable cardioverter-defibrillator (ICD) can be implanted to monitor and deliver whatever therapy is necessary. It will be programmed to detect and diagnose either ventricular tachycardia or ventricular fibrillation, and will deliver the therapy necessary to correct your abnormal heart rhythms. Your electrophysiologist may choose to implant a defibrillator in your body to monitor your heart rhythm around the clock and to immediately correct any dangerous arrhythmias should they occur. 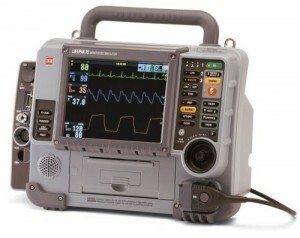 The ICD has two components: the generator and the lead(s). The generator is a relatively small, flat, lightweight case that holds a tiny computer and battery. This will generate the electrical impulses used to regulate your heartbeat. The leads are wires covered with soft, flexible plastic. They are connected to the generator and “tell” it how the heart is beating. The leads also transmit the electrical impulses from the generator to the heart. Our practice specializes in removing leads (pacemaker and/or defibrillator wires attached to the heart) by minimally invasive procedure called as laser lead extraction. The procedure involves use of laser sheaths that breaks up the scar tissue built around leads. The procedure is minimally invasive and requires considerable operator expertise. Our practice does the highest number of laser lead extractions per year in the state of Arizona. The procedure is performed in an operating room under general anesthesia. Once the patient is prepared for surgery, the physician makes an incision close to the old device, and the generator is removed. The most difficult part of this procedure is not removal of the device, but removal of the leads. 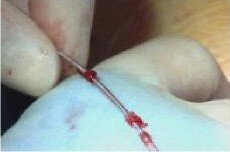 The level of difficulty is typically related to the amount of scar tissue that has formed since the device was implanted. If the wires are unable to be removed with gentle pulling, a special laser extraction device is used. This device consists of a sheath wrapped in laser fiberoptics that is advanced through the targeted vein and over the lead. The physician applies a controlled dose of laser energy to break up (ablate) any scar tissue and free the lead that is then pulled out. Every circumstance is different, so your doctor will let you know if a new pacemaker or defibrillator system will be implanted at that time or after a course of antibiotics. Patients can expect to be in surgery for approximately four hours and are usually admitted to stay one night in the hospital for monitoring and observation if no further treatment is required. Why do leads need to be removed? 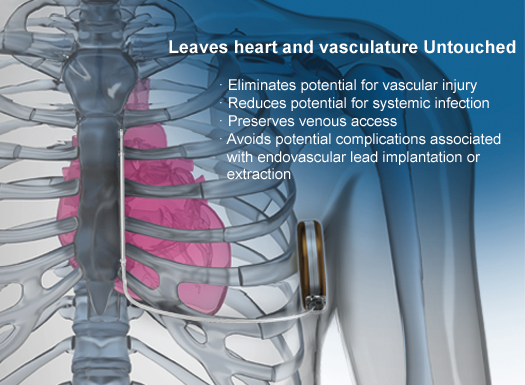 When a decision is made to implant a permanent pacemaker or implantable cardiac defibrillator (ICD), the expectation is that the device will remain in the patient’s body for the rest of his/her life. As with all medical devices, there are certain circumstances that require removal of the permanent system. Such circumstances include infection, inappropriate lead positioning, or lead failure which is often referred to as lead fracture or insulation breach. In addition, as cardiac pacing technology evolves, physicians may wish to upgrade a patient’s existing device with a newer more effective one. The body’s natural response to a foreign object, such as a pacemaker is to form scar tissue surrounding the leads that course through blood vessels down into the heart. 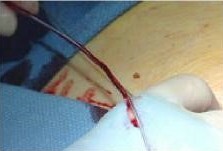 The longer the device remains inside the body, the more scar tissue will adhere to the leads, making removal difficult. 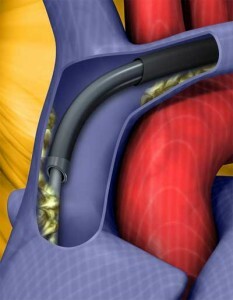 Still, if the pacing device must be removed, leads cannot be abandoned, as they would interfere with new devices or cause damage to blood vessels. The lead is not functioning properly. Sometimes the lead no longer provides a reliable connection between the pacemaker or ICD and the heart. This can be due to damage to the lead, called lead fracture. Large amounts of scar tissue forming at the tip of the lead may also cause the lead to need more energy to function than the pacemaker or ICD is able to deliver. A pacemaker infection or ICD infection has developed. The device and leads may need to be removed to cure the infection. The lead is interfering with blood flow to the heart. Leads that are not being used may need to be removed if they are blocking the flow of blood to the heart. There may be a manufacturer advisory on the lead. If a lead has a higher risk of failure than normal, it may be under a manufacturer advisory and need to be removed for safety. MRI inaccessibility. Newer pacemaker systems are designed to be safe in an MRI environment; however, older, non-compatible pacemaker leads may prohibit access to MRI diagnostic testing. Is laser lead extraction safe? The procedure is successful in 97.7% of patients, and multiple clinical studies have demonstrated safety, effectiveness and efficiency of laser lead removal. The initial PLEXES trial (PLEXES Randomized Trial: Pacing Lead Extraction with the Excimer Laser Sheath) showed a significantly higher success rate in the removal of leads using the laser sheath over manual telescoping sheath tools alone: 94% vs. 64%, respectively. The risk of internal bleeding, a tear in a vein or the heart, or death is very small; however, any medical procedure involves risks. Well-established professional recommendations and use instructions should be followed for every lead extraction procedure. Refer to Important Safety Information for Patients at the end of this media kit for complete information about risks. Every medical procedure carries risk to your health, but in expert hands, laser lead extraction has about a 95 percent success rate, which is significantly higher than for the conventional procedure, known as percutaneous lead extraction. Your doctor will discuss with you the risks and benefits of laser lead extraction. In general, this is a low risk procedure, but it does carry a one to two percent chance of life threatening complications. Common risks of this procedure include bleeding, bruising and infection where the incision is made. Less common risks include damage to the blood vessels, damage to the heart muscle, change in heart rhythm, heart attack, stroke, need for urgent cardiac surgery and death. How does an excimer laser work? Excimer laser is a “cool” laser similar to that used in LASIK for eye surgery. It produces pulsed bursts of UV light energy that are capable of gently dissolving fibrous tissue into tiny, microscopic particles that are easily absorbed by the bloodstream. This is also known as photoablation. This energy is transmitted along flexible glass fibers encased in catheters, which can be passed through arteries and veins. The UV light energy is then focused on the tissue that needs to be treated. The penetration depth is about 50 microns, or about the equivalent of the diameter of a human hair. The laser energy that is produced is absorbed by the binding tissue directly in front of the laser sheath tip, allowing a controlled removal of the lead. What are the alternatives to laser lead removal? Traction and non-laser sheaths are alternatives to laser lead removal. Traction is physically pulling on leads. The amount of traction required for lead extraction increases as the duration of the implant and the tensile strength of the fibrous overgrowth tissue increase. When fibrous tissue growth is substantial, traction alone is not sufficient. Other types of non-laser sheaths use different mechanisms to tear, cut or burn tissue away from the lead. How long has laser lead removal been in use? 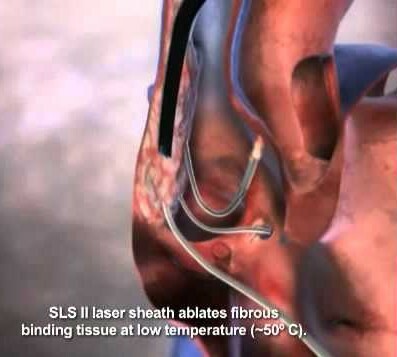 The pivotal randomized clinical trial demonstrating the safety and efficacy of the Spectranetics Laser Sheath (SLS) was completed in 1997. More than 15 years of clinical trials and publications continue to support the safety of the product. Are there cases when the lead should not be removed? When infection is present that does not involve the device or leads, when long-term antibiotics are required or when the patient has atypical lead placement, capping rather than removing the lead may be an appropriate solution based on physician evaluation. There are important safety considerations to keep in mind, however: the risk of failed lead removal doubles every three years, and risk of infection increases 2% to 7% at each device change. Leaving non-functioning leads in place can also cause blood clots or blockages and prevent access for new leads. In some instances, there is “lead on lead” interaction that can cause electrical shocks or inappropriate pace/sense behavior in the device. After the procedure, patients may experience soreness, swelling and bruising at the site where the device and leads were removed. It takes approximately one week to physically recover from the surgery. Ordinarily, your heart beats at a regular, steady pace called a normal sinus rhythm that is regulated electrically by the sinus node. When the heart beats too rapidly, the arrhythmia is called a tachycardia. If the tachycardia originates in one of the upper chambers of the heart, it”s called a supraventricular (above the ventricles) tachycardia (SVT). Your physician may choose to treat your arrhythmia with a non-surgical procedure called cardiac ablation. Often, this treatment permanently resolves the arrhythmia by destroying the abnormal pathway that causes it. A cardiac ablation ablation is very similar to an Electrophysiology (EP) Study. If you haven’t already had an EP Study, the two procedures are frequently performed one after the other. The EP Study helps identify the specific type and location of the abnormal heart rhythm. Then, in a process called mapping, a catheter (small, flexible tube) is manipulated until it locates the abnormal pathway that is causing the tachycardia. At this point, an ablation is performed. 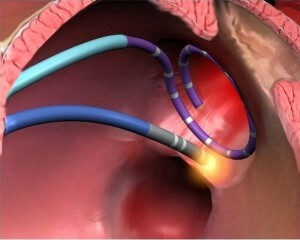 A special catheter will be used to direct energy to the abnormal pathway in the heart. Most commonly used energy is called Radiofrequency (RF). Radiofrequency energy is a form of electrical energy that causes the tissue at the tip of the catheter to heat up, permanently damaging (ablating) that small area of tissue. When the abnormal pathway is destroyed, the heart’s electrical impulses can only travel through the normal conduction pathways, and the arrhythmia is eliminated. Radiofrequency (RF) energy is radio waves that are converted to heat to ablate and create scar tissue. It reliably achieves transmurality and is the most widely used energy source in catheter ablations. In general, high temperatures are needed to make sure that all layers of tissue are ablated. Traditional catheters use unipolar radiofrequency energy, which simply means that the radiofrequency energy is transmitted from a single point at the catheter’s tip. Cryo energy, is intense cold that is used to form ice crystals within the tissue, causing the cells to die and creating scar tissue. It may be easier to make lesions using cryothermy since the cold temperatures cause tissue to stick to the catheter. In addition, cryo energy may have fewer major complications. Animal studieshave shown cryo energy to have a much lower incidence of thrombus (clot) formation than radiofrequency energy, which suggests that cryothermy could lower the risk of a stroke. 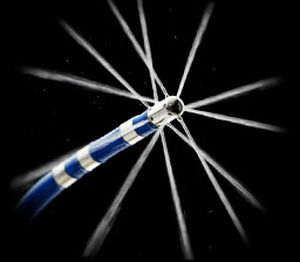 Cryo energy can be used in single point catheters or balloon catheters. Laser energy is light waves that are converted to heat to ablate and create scar tissue. It may be a safer heat-based energy than unipolar radiofrequency energy. With laser energy, the catheter doesn’t need to be in direct contact with tissue, which could mean it will have fewer complications than radiofrequency energy. Unlike other energy sources, contact force is not a factor in whether a laser lesion is transmural. In addition, laser energy can be adjusted when ablating tissues of varying thickness, with higher energy applied to thicker tissue and lower energy applied to thinner structures in the heart. Other energy sources, such as microwave and high intensity focused ultrasound (HIFU), have been studied but these energy sources aren’t widely used in catheter ablation. 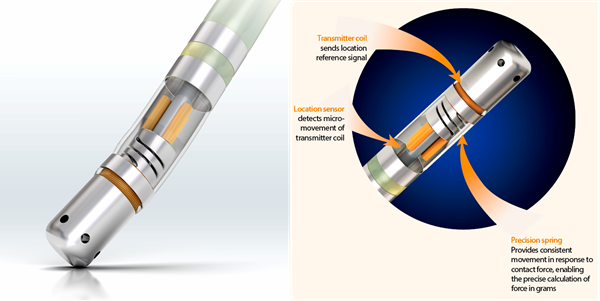 Single electrode radiofrequency catheters emit radiofrequency energy from a single point at the catheter tip. To make lesions, electrophysiologists ablate one spot after another, similar to drawing a line by making dots one after the other. If all the dots are not connected, afib could re-enter the heart in the unablated space (gap). 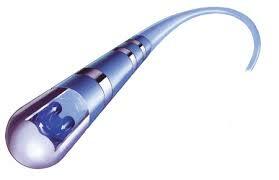 Multi-electrode radiofrequency catheters have several electrodes, each of which can deliver radiofrequency energy. These catheters can ablate a larger area of tissue than single point radiofrequency energy catheters, which could decrease procedure times. In addition, multielectrode catheters may be better at making contiguous lesions (lesion lines without any gaps) than single point catheters. Finally, these catheters can also deliver superficial bipolar radiofrequency energy, which may reduce injury to deeper tissues in certain areas of the heart. However, there is limited clinical data on multielectrode catheters, which means that complications arising from these procedures may not be fully known or understood. 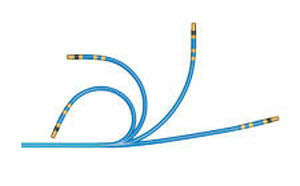 These catheters require higher outputs, and are capable of forming larger lesions that the standard 4 mm tip catheters. 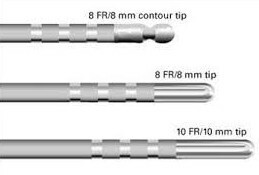 Disadvantages of the 8 mm tip have included a decreased resolution of electrograms, greater catheter stiffness, and therefore decreased compliance and maneuverability. 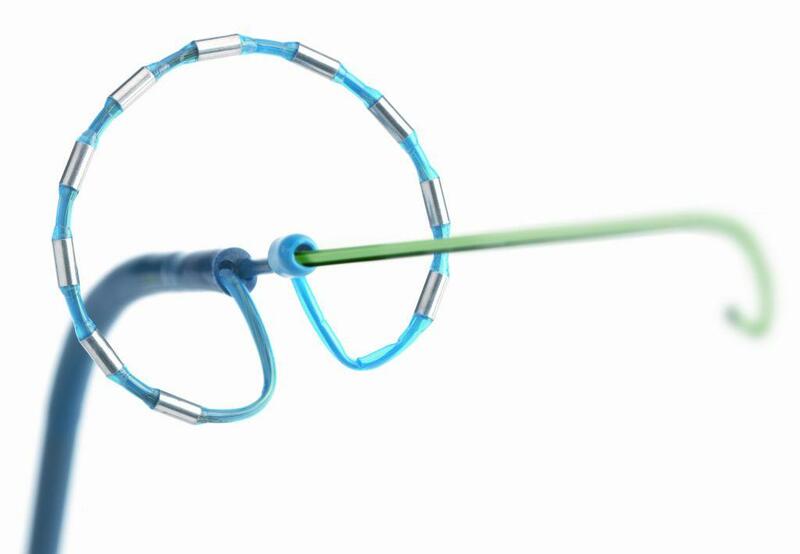 nMARQ™ This new open irrigation multielectrode catheter is in clinical trail in the US for treatment of Atrial fibrillation. 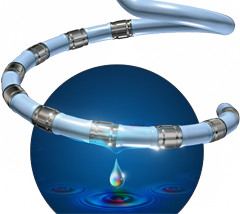 Each nMARQ™ Catheter boasts 10 irrigation holes per electrode completely surrounding the electrodes for more efficient cooling.Uniform irrigation occurs immediately at the site of tissue contact reducing trade-offs between precision and safety. During cardiac ablation, the contact force sensing Catheter enables the measurement of catheter tip contact force and direction inside the heart. If there is not enough force or pressure, the lesion formation may not be deep enough, which would allow recurrence of arrhythmia. If there is too much pressure, complications, such as steam pops, can occur. These catheters tell the electrophysiologist how much pressure is being applied to the catheter and tissue. After the balloon catheter is inserted into the left atrium, the electrophysiologist inflates the balloon at the tip of the catheter. Balloon catheters can ablate a larger area of tissue than single point radiofrequency catheters, which enhances the prospects that lesions will be contiguous (without gaps) and could shorten procedure times. There are balloon catheters using cryothermy, laser energy, and even radiofrequency energy. Disadvantage are that balloon catheters are bulky, lesions are less precise/accurate, they may have difficulty reaching the certain areas of the heart (right pulmonary veins). These catheters do-not allow ablation of areas other than tissues around the pulmonary veins. Atrial fibrillation is the most common irregular heart rhythm, affecting about 2.5 million people in the US, with more than 200,000 new cases of atrial fibrillation are diagnosed each year. Atrial fibrillation is an abnormal heart rhythm originating in the upper chambers of the heart (atria). Several impulses begin and spread throughout the atria, causing a rapid, irregular and disorganized heartbeat. Pulmonary vein isolation (PVI) is a minimally invasive procedure in which a flexible catheter is inserted into the heart via a vein in the leg to electrically isolate the pulmonary veins from the rest of the heart. This procedure can eliminate or significantly reduce the severity and frequency of atrial fibrillation episodes in the majority of patients. AF rotor ablation using rhythm view system (Topera, Inc). Rotors are considered sustaining mechanism for persistent or permanent atrial fibrillation. Our practice has been in the forefront of rotor site ablation and was one of the first sites in the country to offer this ablation in the country. Not all patients may be appropriate candidates for catheter ablation of atrial fibrillation. A thorough evaluation will be conducted to see if this procedure is appropriate. Pre-testing includes a history and physical, electrocardiogram (ECG) and possible holter/event monitor. A transesophageal echocardiogram (TEE) may be needed within 24 hours of the procedure to rule out blood clots in the left atrium. Other tests, such as a spiral computed tomography (CT) or MRI, may be required if you have had previous procedures to treat your arrhythmia. Atrial fibrillation can cause blood to stagnate and form clots in a sac-like structure called left atrial appendage. If a clot forms, it can increase your chances of having stroke. Oral anticoagulants (blood thinners) are recommended to prevent stroke in patients with atrial fibrillation. If a patient does not want to take blood thinners or has contraindications/bleeding problems with blood thinners, then a left atrial occlusion device may be considered. The idea is to occlude the left atrial appendage so that blood clots cannot exit the appendage and so the stroke risk is reduced without taking blood thinners. Currently, the two types of left atrial appendage occlusion procedures are: the WATCHMAN Device Implant and the LARIAT Procedure. WATCHMAN DEVICE : The Watchman device is umbrella mesh-like device that can be placed at the opening of left atrial appendage. 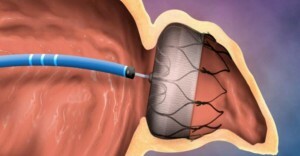 Using standard techniques, similar to ones used in atrial fibrillation ablation procedure, the Watchman device is guided into the heart through a flexible tube inserted through a vein in your upper leg. With the help of transesophageal echocardiogram, the doctor measures the size of left atrial appendage to determine which size Watchman device to use. Then the doctor deploys the Watchman device at the left atrial appendage. Tug testing is done to make sure that the device is well opposed to the appendage walls. Additional pictures are taken with transesophageal echocardiogram to make sure device is well seated. 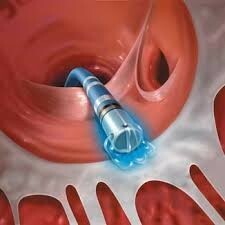 After confirming the final position, the device is released to leave it permanently implanted in your heart. The patient is observed overnight in the hospital and discharged the next day. Watchman device is still considered investigation in the US. It is however approved in over 50 countries. Currently, our practice has done one of the largest number of Watchman implant procedures in the country. 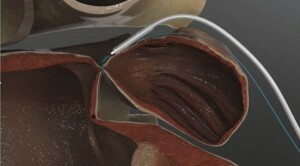 Other LAA Closure DEVICES: Other left atrial appendage closure devices similar to the Watchman device are currently underway and in clinical trials. For more information, please ask your doctor. To see our current research involvement, click here. LARIAT PROCEDURE : The LARIAT Suture Delivery Device is a suture-based device used to occlude left atrial appendage. 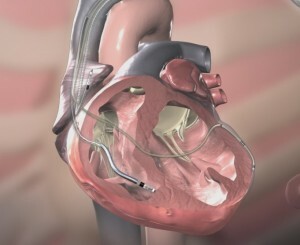 By means of standard techniques, similar to ones used in left atrial ablation procedure, a magnetic wire is placed inside of the left atrial appendage. Then, via a percutaneous epicardial approach, a second magnetic wire is placed in the sac of the heart (pericardial space) from outside by doing a tiny puncture below the breastbone. This second wire then finds the first magnetic wire in the LAA. Next, over this magnetic wire bridge, a LARIAT suture is inserted over the wire in the pericardial space to find the LAA and snare it, ultimately resulting in necrosis of the LAA. Following the procedure, the only thing that remains in the body is a suture ligating the LAA. The patient is observed overnight in the hospital and discharged the next day.